“The plane for the last leg of Liza’s trip was cancelled because of the rain. So when they told her they might not be able to reschedule her flight in the morning, she said, ‘Forget it. I’m going to get there!’ and she took an Uber all the way from Charlotte to get here on time for the show.” Shane Fernando, Director of the new Cape Fear Community College Humanities and Fine Arts Center (affectionately known as “Cape Fear Stage”), swelled with emotion at Liza Minnelli’s dedication to make it in time for her performance christening the new theater. We were standing in the lobby of the largest and most technologically advanced center in eastern North Carolina on the evening of the gala opening. Minnelli was scheduled to play with the North Carolina Symphony. We sipped champagne and watched the building come to life with an influx of hundreds of people. Now moved beyond words, Fernando nodded and made a motion with one hand at his chest to indicate his overflowing heart. He had worked so hard for this evening—leading a team of people to bring to fruition the next stage of growth for the performing arts in Wilmington—that to have a performer of Minnelli’s caliber go above and beyond to ensure the success of the show left him, and others, speechless. The enormity of how far Wilmington’s performing arts scene has come blossomed in front of me as I looked around at the magnificent lobby filled with ice sculptures, a Dorothy Gillespie sculpture on loan from the Cameron Art Museum, and pockets of chamber musicians set up strategically throughout the building. I met Fernando 21 years ago when he was performing in a Thalian Association production of Cabaret, on the Main Stage of Thalian Hall Center for the Performing Arts. We were both on the cusp of aging out of the Youth Theatre at Thalian Association Community Theatre (TACT), though we did a couple of shows together before we disappeared into the behind-the-scenes world. Fernando became an adept and sought-after props master and set dresser. I loved lighting, but usually found myself stage-managing over the next few years. Neither of us knew it at the time, but we were living through a golden time not only in our lives, but theatrically in our community. Dino De Laurentiis opened a movie studio here in the 1980s and by the early 1990s people from all over the world flocked to it—artists, designers, writers, actors—all seeking to break into the film world. During downtime they practiced their crafts in community theatre. Consequently, not only did we work with world-class talents, but it felt like every week another theater company sprang up in town. We can trace the history of the performing arts in Wilmington back to the colonial era: the first play to be written and produced by an American playwright, Thomas Godfrey’s verse drama The Prince of Parthia, was composed here in 1767. The first African-American playwright to have a hit show on Broadway, Willis Richardson with The Chip Woman’s Fortune, was born here in 1923. Throughout the 19th and early 20th centuries, Thalian Hall, Wilmington’s beautiful Antebellum Opera House, was a major stop on the performing circuits: The Barrymores, Joseph Jefferson, Marian Anderson, Buffalo Bill Cody, General Tom Thumb and Edwin Booth are but a handful of the players who trod the boards on the corner of Third Avenue and Princess Street. Years of wear and tear, coupled with neglect, took their toll on the elegant Thalian Hall: the plaster crumbled from the walls, and gilt paint flaked off the vines encircling the stage and support columns for the two balconies. Executive Director Tony Rivenbark launched a massive campaign to raise the funds for not only restoring Thalian Hall to its former glory, but to make it a functional theater space for 20th century productions. In 1990, after an extensive restoration and the addition of the lobby, box office and a black box studio theater, Thalian Hall reopened. Thalian Association, a community theatre group tracing its roots to 1788, and Opera House Theatre Company, a project of former Broadway actor Lou Criscuolo, produced back-to-back musicals almost every weekend of the year. Suddenly, the black box was filled with shows, from classics like Molière’s Tartuffe, to the campy gender bending world of Charles Busch’s Psycho Beach Party and Charles Ludlam’s Irma Vep, to original works by local and regional playwrights. What neither Fernando nor I realized at the time was that all this couldn’t be contained in one building like Thalian Hall. It had a momentum all its own. 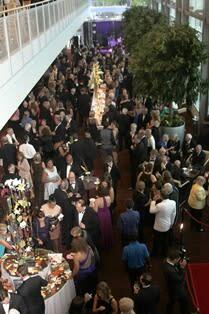 Now Wilmington has an annual outdoor Shakespeare festival, as well as Shakespeare performances in converted warehouses, and a dedicated dinner theater on 10th Avenue and Dock Street at TheatreNOW, as well as theme dinner theater cruises aboard the Henrietta III riverboat and at several local restaurants. Big Dawg Theatre Co. and The Browncoat Pub & Theatre both converted former retail spaces into experimental theatrical venues, City Stage salvaged the beautiful 1910s-era proscenium theater on the fifth floor of the Masonic Temple Building, and multiple children’s theater companies produce shows that rival many national touring productions. More than 38 theater companies operate in a city with a population a quarter the size of Staten Island. But what Wilmington lacked was a venue big enough to attract the big name touring acts that Thalian Hall brought in a century ago. Now Cape Fear Community College’s new Humanities and Fine Arts Center has surpassed all expectations with a state-of-the-art facility that is acoustically secure enough to produce recording-studio-quality audio. 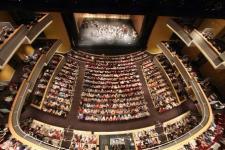 With 1,500 seats, there’s not a bad seat in the house, acoustic designer David Greenberg assures. The upcoming first season is a testimony to what a regional venue it will be: the North Carolina Symphony Series will host six concerts and The PNC Broadway Series will bring Mamma Mia and Joseph & The Amazing Technicolor Dreamcoat. The Star Series will bring Boz Scaggs, Lily Tomlin and Jackson Browne. Downtown Wilmington, where the center is located, is also perfectly positioned for even more things to do. It’s adjacent to the award-winning Riverfront and near more than 200 shops and restaurants in the downtown area alone. 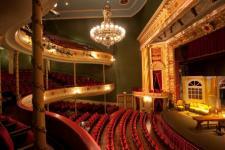 Plus, its charming architecture makes up one of the largest historic districts in the U.S. Visitors to the center will find no shortage of activities to keep them in the area. 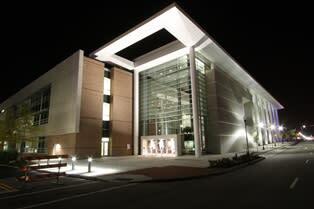 The center is also a learning laboratory for Cape Fear Community College students. The drama department will present an anniversary production of Orson Wells’ War of the Worlds to be simultaneously broadcast on radio, as well as Ibsen’s Hedda Gabler and A Charlie Brown Christmas. Besides onstage time, students will gain hands-on experience behind the scenes at a working theatre—just like Fernando and I did. 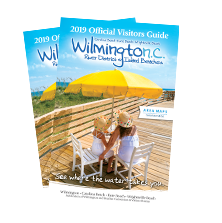 You are invited to do the same and explore the arts and culture scene in Wilmington, North Carolina and its island beaches.